The Chula Vista Elementary School District funds a full-time Science Resource Teacher, Karen Quirós, who works closely with the Living Coast Discovery Center staff to provide K-8 Coastal Education Programs at the Living Coast Discovery Center. This partnership was established to provide standards-based, hands-on science classes to schools throughout the district since the Center opened in 1987! All programs offered are standards- based for Kindergarten- Eighth graders. They are aligned with the Common Core, Next Generation Science Standards and the previous CA State Science Standards. Programs for Preschoolers and Kindergartners are either 1.5-3 hours long, programs for 1st-3rd graders can be 2-4 hours long and programs for 4th- 8th graders are 4 hours long. The Coastal Education Program can take up to 38 students per program. The primary grades may bring up to 3 classes on one day and secondary classes can bring one class per day. There are 24+ different programs available for grades Kindergarten- 8th. For programs and descriptions please click here. A study trip to the Living Coast involves a focused instructional time with the Science Resource teacher and a guided tour with a Discovery Center Docent. The tour of the Living Coast includes Turtle Lagoon, Raptor Row, Eagle Mesa, the Shorebird Aviary and time to touch animals in the Shark and Ray Experience. NEW convenient online registration now available!! You can go to https://tickets.thelivingcoast.org/ or click REGISTER. Your login is your school name as all one word with the first letter capitalized. For detailed instructions on how to register online, please click here. There are two Registration Sessions each year; one in the beginning of the school year for classes wanting to attend during the Fall Session and one in November for classes wanting to attend during the Winter/Spring Session. All Classes that register during session are entered. Cut off is 11:59pm on August 1st. All Classes that register during session are entered. Cut off is 11:59pm on November 14th. Thank You Port of San Diego! The Chula Vista Elementary School District was awarded $68,800 by the Port of San Diego for its Coastal Education Program, located at the Living Coast Discovery Center. Following very successful periods of funding the Port's Environmental Advisory Committee has a awarded another 5 years of funding that will allow students to have access to a Coastal Education Program. The largest obstacle for teachers planning a study trip is the high cost of transportation. The funding from the Port eliminates this obstacle and allows equal access for all students in the CVESD to participate in this highly valuable experience. Thank you Port of San Diego! Since January 2010, funding from the Port of San Diego has made it possible for more than 22,000 students from almost 800 classes to attend a Coastal Education Program at the Living Coast Discovery Center. A major obstacle for teachers is the cost of transportation. The funding from the Port eliminates this barrier, which makes the program more accessible to all Chula Vista Elementary students. During the next five years, the funding from the Port will allow about 20,800 more local students and about 2,400 chaperoning adults access to environmental education that focuses on storm water and watershed awareness, pollution prevention, and waste reduction. “The total population of students served has increased every year that the Port has provided funding. 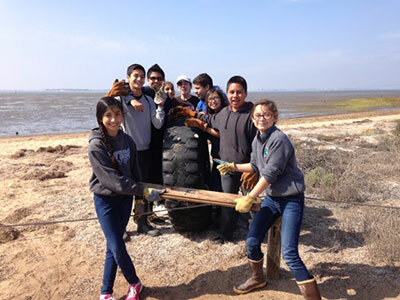 By the end of this five-year funding period, the Port will have played a direct role for more than 40,000 students learning what they can do to keep the San Diego Bay and surrounding watersheds free from pollution,” noted Quirós. To view the October 2017 Press Release in its entirety please click here. The Living Coast Discovery Center, a 501(c) 3 educational zoo and aquarium located within the San Diego Bay National Wildlife Refuge on Sweetwater Marsh, began operating as a non-profit in 2010 after assuming operations of the Chula Vista Nature Center. The Living Coast Discovery Center offers hands-on exhibits and up-close encounters with plant and animal species native to Southern California coastal habitats, including endangered sea turtles, sting rays, leopard sharks, jellies, shorebirds, reptiles and a large collection of raptors such as hawks, falcons, owls, American bald eagle, golden eagle, and more. More information about the Living Coast Discovery Center is available at www.thelivingcoast.org or (619) 409-5900 . What's New at the Living Coast Discovery Center? Overnight Adventures! After a full evening of fun activities, we will snuggle down in our sleeping bags for a movie and cozy indoor camping in the Discovery Center's auditorium. Don't miss an evening of discovery and fun! For information on Overnight Camps, click here.